comic book artist- Nate Powell. Archives For comic book artist- Nate Powell. My school district recently purchased a class set of the March Trilogy, the graphic novel memoir that recounts the experiences of Congressman John Lewis (5th District, Georgia) in America’s struggle for civil rights including the marches from Selma to Montgomery. The comic book-style illustrations are engaging and some may mistake the memoir as something for children. Lewis’s experiences in the 1950-60s, however, were marked by violence, so the memoir is recommended for more mature audiences (grades 8-12). The March Trilogy is the collaboration between Congressman Lewis, his Congressional staffer Andrew Aydin, and the comic book artist, Nate Powell. Their collaboration project began in 2008 after Congressman Lewis described the powerful impact a 1957 comic book titled Martin Luther King and the Montgomery Story had on people like himself who were engaged in the Civil Rights Movement. The comic book has been reissued by the original publisher, Fellowship of Reconciliation with a new editor, Israel Escamilla. This website is created by Veterans of the Southern Freedom Movement (1951-1968). It is where we tell it like it was, the way we lived it, the way we saw it, the way we still see it. 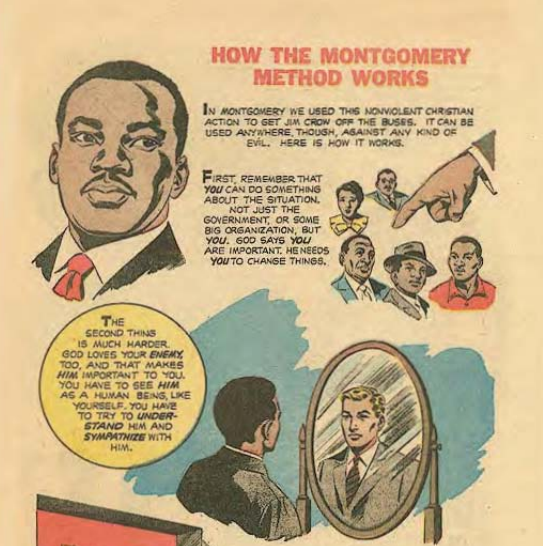 The decision to publish the Martin Luther King and the Montgomery Story as a comic book in the late 1950s is a bit surprising. At that time the genre of comic books in America had come under scrutiny. A psychiatrist, Fredric Wertham, made public his criticisms that comic books promoted deviant behavior. That claim in 1954 led to the creation of a Senate Subcommittee on Juvenile Delinquency along with the Comics Code Authority (CCA). That Authority drafted the self-censorship Comics Code that year, which required all comic books to go through a process of approval. In 1958, the Friends of Reconciliation published the 16-page comic book as a challenge to CCA restrictions. An artist from the Al Capp Studios, creators of Li’l Abner, donated time to illustrate the book. Benton Resnick, a blacklisted writer, wrote the text. He concluded with a promotion for the “thousands of members throughout the world [who] attempt to practice the things that Jesus taught about overcoming evil with good.” The Friends of Reconciliation’s religious message passed the scrutiny of Senate Subcommittee. Martin Luther King and the Montgomery Story was distributed through churches, universities, social justice organizations and labor unions during the Civil Rights Movement. 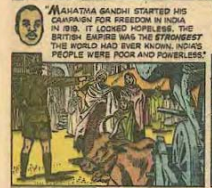 Now in reproduction, the comic book has been widely circulated to support international struggles for civil rights, including Egypt’s Tahrir’s Square. Several frames later, there are illustrations showing Rosa Parks’s arrest when she refused to give up her seat on the bus in Montgomery, Alabama. These events are narrated by a fictional character named “Jones”. His role is to introduce the reader to the 29-year-old Reverend Martin Luther King, Jr, a preacher from the Dexter Avenue Baptist Church. Dr. King will become the charismatic leader who planned the bus boycotts in Montgomery. In the comic book, several frames show how protesters rehearsed for confrontations during protests. King wanted protesters to practice the tenets of non-violence the same way that Mahatma Gandhi had used non-violence in liberating India from the British Empire. Where you can, talk to the people concerned and try to explain how you feel and why you feel as you do. Don’t argue; just tell them your side and listen to others. Sometimes you may be surprised to find friends among those you thought were enemies. 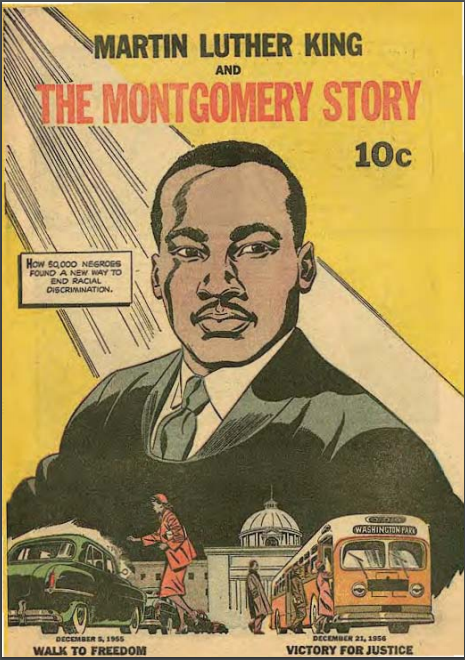 This comic book Martin Luther King and the Montgomery Story can be used to prepare students for the graphic novel memoir by Congressman Lewis, a veteran of the Civil Rights Movement. While he is not directly named in the 1957 comic book, he participated in many of the events and his memoir March provides another point of view to major events. In Lewis’s recounting, March: Book I is set up as a flashback in which he remembers the brutality of the police on the Edmund Pettus Bridge during the 1965 Selma-Montgomery March. The second book, March: Book 2 (2015) highlights the Freedom Bus Rides and Governor George Wallace’s “Segregation Forever” speech. The final book, March: Book 3 (2016) includes the Birmingham 16th Street Baptist Church bombing; the Freedom Summer murders; the 1964 Democratic National Convention; and the Selma to Montgomery marches. March: Book 3 received multiple awards including 2016 National Book Award Winner for Young People’s Literature, the 2017 Printz Award Winner, and the 2017 Coretta Scott King Author Award Winner. He could just as well have been speaking about Martin Luther King and the Montgomery Story. They may belong to the genre of comic books, but they also are serious records of our history.